28 April - 30 September. 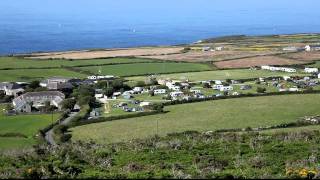 Trevalgan is a quiet, traditional style of park, on the cliffs 2 miles from Saint Ives. 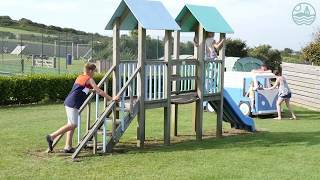 It is a truly rural location where you can enjoy spectacular views and an abundance of flora and fauna and plenty of space for children to run. The present owners, who took over in 2013, have made developments to the site including new sanitary facilities with underfloor heating, some pitches have hedging for privacy and a security barrier at the entrance. There are 135 clearly marked pitches (112 with 16A electricity and some with water as well) in two level fields edged by Cornish stone walls – it could be a little exposed on a windy day. The park is very popular with walkers, with access via footpaths to the South West Coastal Path. A fully equipped heated toilet block includes family shower rooms, a baby room and facilities for disabled visitors. New reception and shop (fresh bread, coffee and local produce). Laundry room. Motorhome services. Gas supplies. Games field, adventure play area. Purpose built games room. Take St Ives exit from A30, then 1st exit at 2nd mini roundabout. At T-junction turn right onto B3311 passing through Halsetown. Turn left at next T-junction into B3306 (St Just). After 0.5 miles, turn right at brown sign and follow single-track lane (with passing bays) for 0.5 miles. Keep right at small triangle. Site is on right. Do not use sat nav. Arrive well after mid day to avoid on-coming traffic.